The story begins in medias res, with Wonder Woman urging Superman to "Do it, Kal! It's the only way. Burn me!!" We next see Wonder Woman bathed in the intense rays of Superman's heat vision. Analepsis returns us to the present, where Superman, with League members Flash, Green Lantern, and Wonder Woman, are on their way to secure the release of Hawkgirl from Batman. They meet Batman at the entrance to the Batcave, only to be alerted that Hawkgirl has just arrived at the Watchtower. Hawkgirl holds a match to prove that she isn't the Martian Manhunter. Wonder Woman gives Batman a final warning to not interfere with League activities, but Batman walks away. The Flash tries to talk to him, but Batman flies away, revealing himself to be the Martian Manhunter. The League pursues the Manhunter, but he evades them by becoming intangible, he attacks Green Lantern and dispatches him. While Wonder Woman assists Green Lantern, Manhunter explains to Superman his reasons for siding with Batman, revealed through mentally linking himself to Superman's mind (and a wee more analepsis). He shows what happened on Mars in the war between the Green and White Martians, and reminds Superman of the way he felt when Lois died at his hand. Wonder Woman severs the link, and Manhunter attacks her, allowing his malleable form to become gelatinous and invades her body through her mouth and nose. Wonder Woman tells Superman to burn her, knowing how susceptible Martians are to fire. Superman unleashes his heat vision, burning and killing the Martian Manhunter, while Batman looks on from some distance away. "Superman vs. Martian Manhunter: Who wins?" "No way! Manhunter will take over his mind, and mindwipe him!" "Manhunter can turn invisible, he's just as strong, fast, invulnerable, he's got Martian vision, and he's got the mental powers to control other heroes and throw them at Superman! How's Superman gonna beat all that?" "Man, his weakness is fire. Fire. Superman has heat vision. There's nothing for it." Taylor's depiction also calls into question his knowledge or enforced ignorance of the characters and their abilities. It's unlikely that Taylor doesn't know the ins and outs of these characters, but anyone with a rudimentary knowledge knows that Superman didn't have to kill Manhunter. Hawkgirl demonstrates this by putting out the match offered to prove her identity. A single match is used, not a conflagration. Superman could have used enough power to force J'onn out without killing him, unless we're to believe that there was no other way, he did what he had to do, there would be no way to contain the Manhunter afterwards, and other such trite excuses for Superman murdering J'onn. Wonder Woman's durability shows that there was an alternative, unless we're to believe that her life was in peril due to asphyxiation, even though she's still able to talk, and better than that, fly. It would be easy to say it's all bad writing, but as a man told me not long ago: "Art can happen by accident." While this is surely not a case of art, it is an accidental reminder of the promise and purpose of Superman. Superman doesn't kill. Whether purposely or accidentally, Taylor's story is a maladroitly crafted treatise on the subject of what happens when Superman crosses that line, and what happens is, he kills again, and again, though in this issue it's not a kill, because what happens to J'onn is murder. There's a Homepage member whose name escapes me, but the member has wisely said on more than one occasion, that once you have Superman kill, what does he do when faced with a similar, if not the same situation? If he finds another way, it's a cop-out, and if he kills again, he's no longer Superman. He's no longer the epitome of what we can be, but merely an aggrandized version of what we are. If we look back, the defining moment wasn't that Superman killed the Joker, it was that he was willing to kill Doomsday. Superman did not seek to protect Lois and his unborn child, to ignore the threat of Doomsday and focus on getting his wife to safety, rather than engross himself in battle, and that error, that readiness to indulge in blood cost him his wife, unborn child and all else that follows. The Joker's death is the same indulgence. Nightwing would be alive if Superman was about his business; it was the same situation as in the Batcave. The parademons are a hideously awesome display of his power used incorrectly, and now he's murdered J'onn, who sides against him quite foolishly because of what Superman "could" become, rather than work to help restore him to what he was. J'onn's cool decision to kill Wonder Woman is a filmy plot-device at best, but it continues to highlight where Superman is now that he's broken his most sacred code. It's an accidental, brilliant examination, and if only it could accidentally be written better. Art - 3: Miller. It sounds nothing like Derenick. Seriously, Miller's hand seems to be to make everyone grit their teeth and scowl. The script for this issue doesn't really call for any feats of strength artistically, and had that been the case, Miller might have delivered a wee more than what we were given. 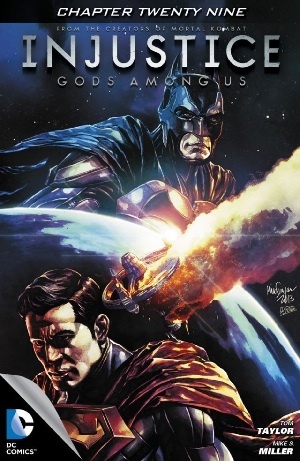 Cover Art - 4: The more I look over the cover, the more I want Superman to wreck the Batman once and for all. That's just where I'm at right now.